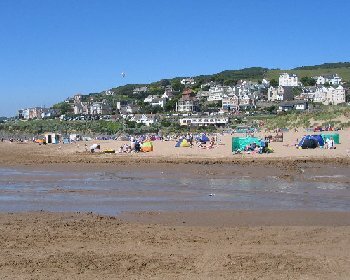 Woolacombe is a nice seaside town with a huge sandy beach which stretches south for about 2 miles. The beach is popular with surfers and families and there are plenty of facilities and parking. To the north of the main beach is a large rocky area and beyond that there are two smaller beaches Barricane Beach, which is quite small and narrow and Combesgate Beach which is larger. Update March 2015 - We have a report of palm oil being washed up on Woolacombe Beach. This is poisonous to dogs. Please exercise caution when walking dogs on Woolacombe Beach and beaches in north Devon. Lifeguards in summer. See Beach Safety Guide. At Woolacombe, access is via 2 short sloping paths. South of the town there are various paths through the dunes to the beach. At Barricane Beach and Combesgate Beach, access is via steep paths. Dogs banned Easter Day to 31st October on Woolacombe Beach from the rocks to the stream. South of the stream until Mill Rock, dogs are allowed all year on leads. South of Mill Rock, dogs are allowed all year without restriction. Woolacombe is close to Ilfracombe which is 45 miles from Bude and 52 miles from Exeter. There are various routes into North Devon. From North Cornwall take the A39 (North Atlantic Highway) past Bude and into North Devon towards Barnstaple. Approaching Barnstaple at the Lake Roundabout turn left onto the A361 (signposted to Ilfracombe). Alternatively from Exeter take the A377 and approaching Barnstaple at the Bishops Tawton roundabout turn west onto the A361 and continue on the A361 until Lake Roundabout and turn right to continue on the A361 (signposted to Ilfracombe). Follow the A361 over the new road bridge over the River Taw and then at the Braunton Road Junction turn left for Ilfracombe. Continue on the A361 through Braunton towards Ilfracombe. Then at the Mullacott Cross roundabout turn left onto the B3343 signposted to Woolacombe. Follow the B3343 for about 3 miles to Woolacombe. 3 car parks in the town a short distance from the beach. To the south of the town there is also parking along Marine Drive. There is some road parking by Barricane and Combesgate Beaches.